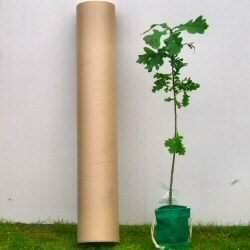 Over the last few years we have supplied many companies with different quantities of small trees in drawstring bags for various green eco events. The feedback has been very positive and has raised the awareness of the need to plant trees for helping the environment and arguably counter the effects of escalating carbon emissions. Native tree species are very popular, for example, silver birch, mountain ash and oak. Christmas tree varieties, such as norway spruce and nordmann for also are popular. We have worked previously with our customers and are able to add your company literature to each tree and also able to fit the tree gift to your requirements. Please contact us for further details.